We’ve been offering our carpet cleaning services to residents of the Kingston upon Thames area for several years. During this time we’ve worked with clients from all around London and our workers have had to clean some badly stained carpets. However, we have always done a magnificent job when it comes to carpet cleaning and our workers easily met the expectations of our customers. So give us a call if you are looking for a reliable carpet cleaning services that won’t cost you a small fortune. We wouldn’t have achieved such a success if it it wasn’t for our devoted employees. We employ a dedicated carpet cleaning team which specializes in cleaning carpets of all types by applying different cleaning methods. Each one of our workers has been professionally-trained and is capable of utilizing different cleaning techniques depending on the situation. One of the best things about our carpet cleaning service in Kingston is that we have a unique approach towards every situation. This guarantees that we will always use the most efficient cleaning product and choose the product that will deliver the best results. Having your carpets professionally cleaned at least 1-2 times a year is recommended by the top carpet manufacturers in the world. Book our service at least 2 times a year and we guarantee that your carpets will benefit from our cleaning methods. It is proven that maintained carpets that are deep cleaned every couple of months enjoy a longer life. Basically, your carpet cleaning package is a great opportunity to restore the good condition of your carpets and protect your investment. 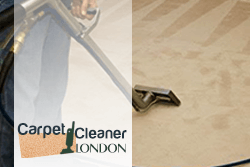 When it comes to professional carpet cleaning, no one in or around KT1 London does it better than our team of experienced, vetted and skilled cleaners. Our reputable company provides carpet cleaning services that live up to the highest standards of the trade. We charge competitively so that anyone can afford to book us. The service is exceptionally effective. We begin by evaluating the condition of your carpet and identifying the origin of the stains. Our operatives will hoover the fabric and pre-treat the stubborn stains before finishing off with hot water extraction and deodorisation. Your carpet will not only look clean, it will feel clean. Don’t believe us? Make a booking and see for yourself!